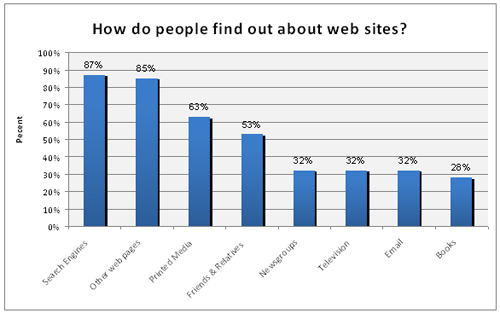 How do people find out about web sites? It’s that simple. If you work in any type of business today, your Website is literally a 24/7 representative to a worldwide audience. This article illustrates 10 Common Mistakes that Plague Most Web Sites! I’m sure they’re hundreds more, but based on my experience, here are the 10 most common problems that I’ve found. Web standards are basically following the best technical practices to ensure your site is accessible to the most people. Your web site will be lighter (less code), load faster, easier to manage and maintain, and be accessible by everyone. Visitors with browsers other than Internet Explorer on a Windows operating systems will be able to use the site. Visitors that have CSS disabled or do not support it will get an unstyled well-structured fully usable page. Your site will be usable in mobile and handheld devices. If you’re web site is not updated on a regular basis (atleast once or twice a month) you will loose serious search engine points, PERIOD!! Search engines like Google, Yahoo and MSN have certain standards, one of which is fresh content. Basically, your site will slowly descend in the search engine results. I’m not concerned with search engine rankings, why should I update my web site? Simple! Your current visitors and customers will not return! Returning visitors expect to see fresh and updated content. If you visit a web site and nothing has changed in 6 months, would you return next week? Your navigation needs to be extremely simple and easy to, well, navigate. The 2 common places are at the top and left of the page. Wherever you place your navigation make sure it is clear and loads quick. NEVER use flash for your navigation, I would also steer away from using images. If at all possible use plain text. There are a ton of great CSS (cascading style sheet) menus available and they load quick and anyone can view them. If your web page does not load within 8 seconds, most visitors get frustrated, and move on to other pages or sites. No more web counters! Stop putting those little mileage-readout type thing’s on your web site. They were cool in 1996, but counters actually make the web site look unprofessional. Also, if the numbers are low a visitor may think your web site is not good enough to attract many visitors. Almost every single web hosting company provides detailed statistical information that you can use. You may also open a Google Analytics Account. Black is probably the worst color to use as a background for text. There’s a reason newspapers and books use white backgrounds with black lettering! Having a dark background behind your text makes your pages hard to read. I have trouble reading white text on a black background and I’m definitely not alone and don’t even think about red text! Dark text on a light colored background will insure that everyone can read your pages with ease. You can use colors to accent words or headings, but avoid using bright colors for the entire content. There are only a few safe web fonts that all visitors can see: Arial, Arial Black, Comic Sans, Courier, Courier New, Georgia, Impact, Times New Roman, Trebuchet MS and Verdana. This means you’re probably the only one that can see the cool spray paint font you just used. Also, choose a font size that is at least 10pt. Make it something that you can easily read yourself. No, no, no!!! Although they may be cool to look at once, Flash Intros get really old if you have to see them every time that you visit that particular site. Plus, most people don’t have broad bandwidth and can’t even enjoy the flash because it takes so long to load! The same can be said for Java Applets and Animations. Don’t do it! You’ll loose current visitors and potential customers! A little flash header or side accent is ok, but NEVER use flash for your navigation. I cannot stand when I go to a site just to find the address and have to wait for the navigation to load. I just leave and forget about the site! Flash also makes it impossible for the search engines to find your Website because they just see the code for the flash movie instead of actual text. Like flash intros, Entry pages are equally counter-productive. An entry page is a huge graphic which takes 3 minutes to load only to cleverly offer you to “click here to enter.” Most visitors will leave before it loads and as a result, will never have the ability to enter your site to learn about you and your products. I know I most certainly leave when I see one of these monstrosities loading! It’s almost frightening! Entries are for buildings, not Websites. Everyone is guilty of disregarding the use of SPELL CHECK from time to time, but it is an integral factor that can not be overlooked! It shouldn’t stop at spell checking either. Proof read the content of your web pages to make sure that you don’t miss the little things. I am guilty of this a lot. For example, using “You” instead of “Your.” Little things like this can be very damaging and will display a grossly low level of professionalism to your current and potential customers. Basically, it all comes back to usability. Make sure your web site as user friendly as possible. Creating a great looking, easy to navigate Website is a necessity for anyone who is serious about making money the internet. Remember: You must create reasons for your visitors to return to your web site! As I took a break from writing this top 10 list, I unfortunately came across another massive and extremely annoying mistake; Automatic Music! Remember you never know where a visitor of your web site is located. They might be at work, or it may be 1am in the morning while the kids are sleeping. Having music screaming from the computer is usually frowned upon and quite terrifying. I know there are a few web site owners that are going to get a bill from me for new boxers.